Colombia’s President Ivan Duque has failed to consolidate a stable majority coalition in Congress, leaving it unclear how he will be able to execute his hard-line policy proposals. Duque did not just fail to consolidate in a majority in both the Senate and the House of Representatives, the coalition U Party could also split. Powerful lawmakers in that party fiercely oppose the president. The incarceration of Conservative Party Senator-elect Aida Merlano left one seat empty in the Senate, further weakening the conservative president’s support in Congress. While all this is bad news for Duque, it could be good news for the country’s ongoing peace process that has been opposed by the president and his hard-right Democratic Center party. Duque may have won the presidential election, but the legislative elections in March made the leftist opposition in Congress stronger than ever. Furthermore, two major parties who supported Duque’s successful presidential campaign, the Liberal Party (PLC) and Radical Change (CR), said this week they will not take part in the coalition, but remain independent. The U Party of former President Juan Manuel Santos surprisingly voted to join the coalition on Wednesday, but is fractured and could split. If this happens, Duque’s minority coalition would become even more vulnerable. The only solid partners of the president’s hard-right Democratic Center (CD) party are the Conservative Party (CP) and two small Evangelical parties, by far not enough for a majority in either the Senate or the House of Representatives. The incarceration of Conservative Party Senator-elect Aida Merlano is likely to leave her seat empty, further chipping away support for the government in Congress. Duque has refused to share government positions with other parties, making sure that within the legislative branch he has full support for his conservative policy proposals. But by refusing to share power with other parties, he lost the support of the centrist PLC and the center-right CR he enjoyed while on campaign. PLC president Cesar Gaviria and CR leader German Vargas said Wednesday that their parties will support the government proposals they deem convenient, but will oppose those deemed too extreme. 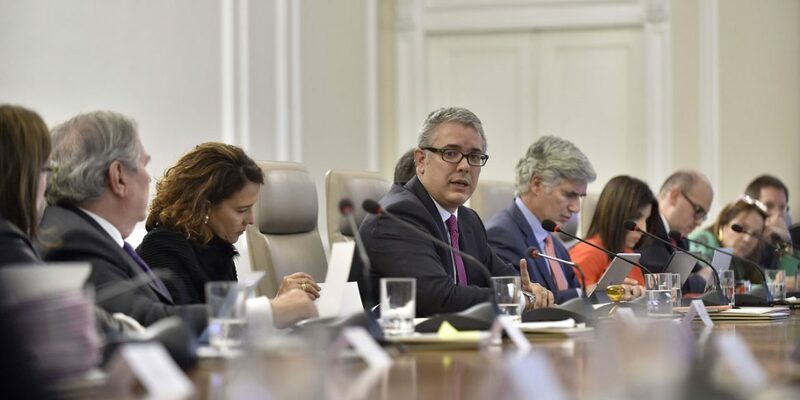 This means that Duque will have to negotiate each policy proposal with these parties that both have their own political agendas and priorities. Duque’s main liabilities may not lie in the opposition to his policy proposals, but stark divisions within his own coalition. His own party is reportedly deeply divided between radicals that support his political patron, Alvaro Uribe, and “new conservatives” like Duque. Uribe’s impending witness tampering trial has been hanging over the party like the sword of Damocles. The country’s ongoing peace process is likely to mean the political death of many of the party’s radicals who teamed up with paramilitary groups during the war. The U Party might not even survive this legislative turn; after the party’s lawmakers voted 25 against 16 to join Duque’s coalition, powerful senators like Roy Barreras and Armando Benedetti threatened to blow up the party. As if the legislative instability weren’t enough of a challenge for the president who hasn’t occupied one significant executive position in his life, his initial approval rating is the lowest of any president ever since Gallup began polling in the 1990s.